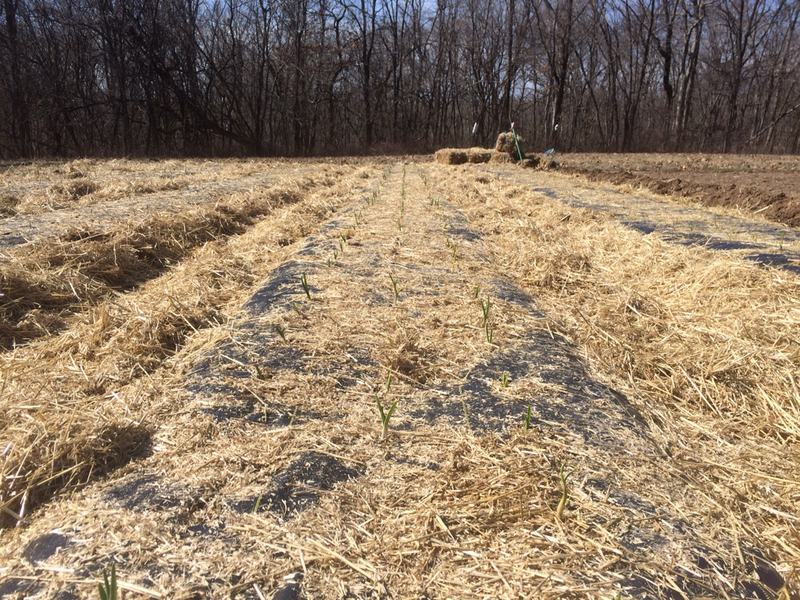 Sunny and 65 degrees today, so I decided to rake off the straw mulch and let the sun warm the garlic patch. 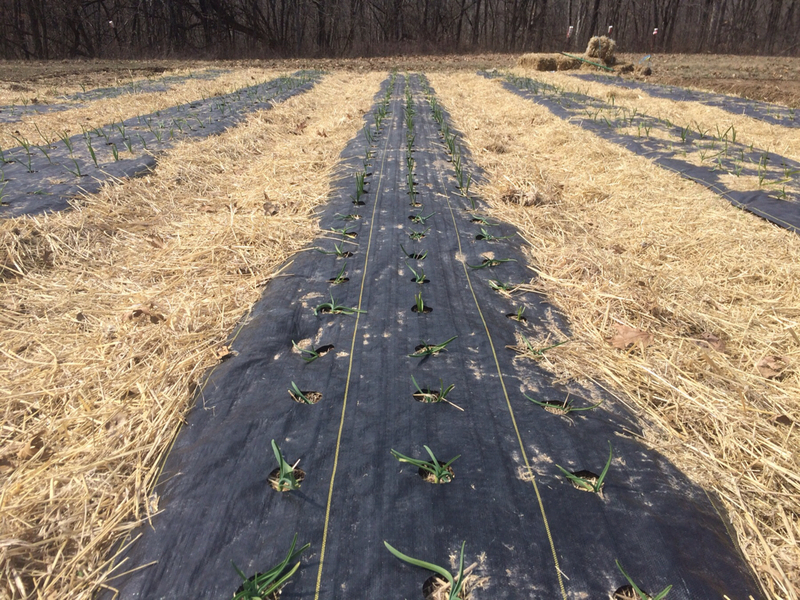 It looks like 99% of the garlic made it thru -30 degree wind chills this winter and has sprouted. Oh wow PMC! So happy to see it! Spring has arrived!!!! Congrats!!! Not quite spring yet, but this was a good sign. I was kinda worried as it was a lot colder than normal here this winter. Hope it killed a lot of bugs. same outlook for here as sari in finland. i still have over two ft of snow on my garden. i missed planting my garlic in the fall when our weather turned winter in late october last year. i will be spring planting by necessity as soon as possible. nice to see the garlic coming up, a welcome sign of better weather ahead. Well... there may be close to a foot of snow on my garlic beds for the past two days, but that is the deepest snow cover they've had all winter. This morning's snow has turned to freezing drizzle and the high will be above freezing today, and every day in the forecast this week is above zero although near the freezing mark. If there's any sunshine at all, there won't be snow on the raised beds for long. But still we are a long way from the usual 'frost free' date of June 4, and normally see lots of winter weather still in March and April. I am certainly curious to see how the garlic fares with such a snowless winter, and so many thaws. I learned this technique from a pro! Love your "gardeining" space-- picture made my heart go pitter -patter! Glad your garlic made it!!! It's on a 360 acre parcel my cousins own, my garden space is around an acre and a half. Most of the property is timber and bottom ground. There's about 15 acres planted in corn every year, that gets less productive every year. I'd like to figure out something profitable to grow there instead of corn, beans and wheat which is all the farmers grow here. Im sure you will find an alternative crop. Having a market is the first challenge. Not that I know much, but goats and goat milk products seem to spring up everywhere. It could be that there is a wealth of money in this area so there are ready buyers for exotic products. 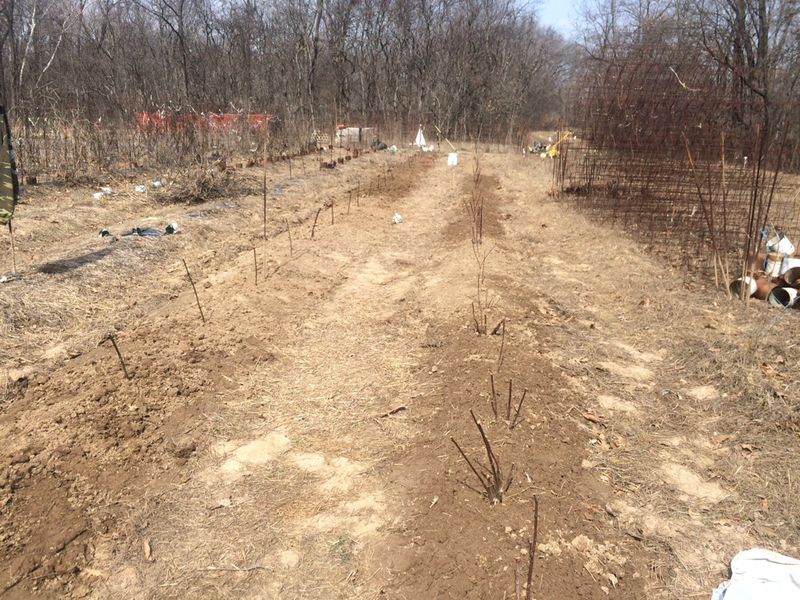 Planted 27 thornless blackberries, and 34 red raspberries, black raspberries should in soon. Doesn't look like much, hopefully by next year it will look awsum. I ordered 50 eversweet strawberries and 6 prime ark freedom....just for family use. To learn how to care for these, then add more. I watch alot of utube videos posted by universities to find good varieties . Best place I found to buy plants is Nourse Farms. The red raspberry “Killarney” I planted, came from there. The best are free plants which the thornless blackberries were. A guy gave me a bag of huge frozen blackberries last year that were really good. I asked if had any plants to thin out... he said yeah... I easily could have dug 200 plants out of one bed. But settled on about 30. Years are not alike and gardening this far north shows the variability really well. Last year this time I had first garlic sprouts poking through the frozen soil. This year we have almost two feet of snow and it does not show any signs of melting. 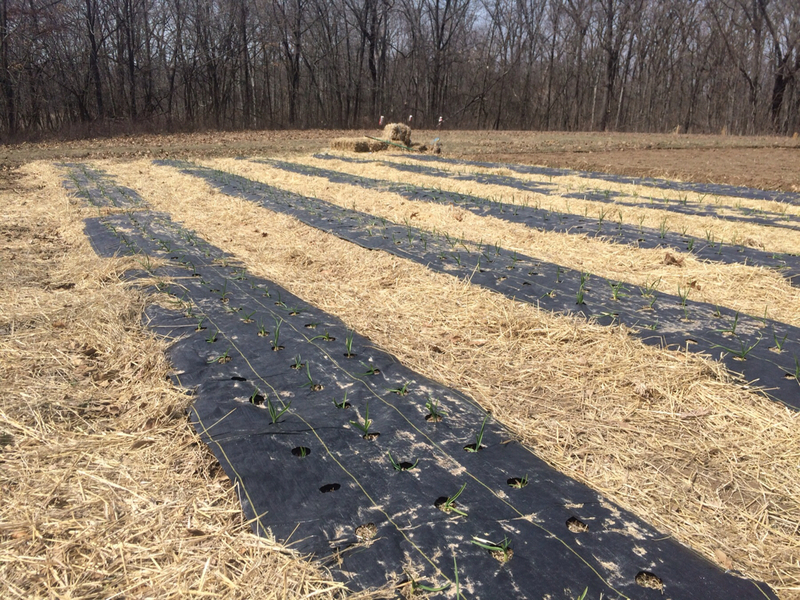 Upper photos are from the raised beds and field last year in March and lower are what it looks like at my garlic beds now.